Iridology is the study of the colored ring around the pupil of the eye which is called the iris. In animals, what an iridologist looks for is the shading and any fibers seen, as well as color, as those signs may indicate a current or genetic predisposition of irritation or inflammation in the area. The iridologist would identify the area of the body experiencing pain or inflammation or the potential for it, by using the iridology chart or grid. Understanding what is showing in your dog, cat, or horse’s eye can help you to avoid health problems before they start, as well as understand how to work effectively with your animals’ health when they do have a health issue. The structure or design of the iris fibers is a genetic clue as to potential health issues. Although most signs may never become an issue unless something happens via lifestyle or diet, identifying genetic predispositions is of great benefit in breeding animals for a stronger line. Iridology in itself is not an actual treatment. It is a non-invasive method, often used by homeopaths, naturopaths, holistic veterinarians, and other natural animal health practitioners to determine a required treatment plan. An iris analysis can help to explain what the source or where the original cause of a health problem might be coming from, which can be quite different than the symptoms displayed. It can explain health issues or symptoms which the vet may have difficulty identifying the source of the problem is or why the animal is doing something. An iridologist looks for the shading, color, and extra pigments. Pigments can indicate trauma or injury to a part of the body which may explain why the animal may not be displaying symptoms of pain or illness. Unusual sudden reactivity of animals to their environment or other animals. 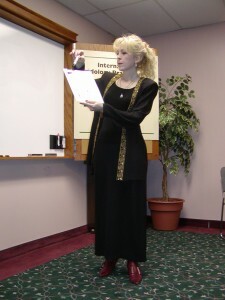 We offer Iridology Certification Courses through Correspondence. Our courses open the door to a rewarding career in the Natural Health field. You will learn an amazing skill that will teach you about body systems and lifestyle changes to help both you and your clients lead healthier, happier lives. Our instructors are certified through the International Iridology Practitioners Association, which means our courses are approved and updated with the latest information in iridology via the annual International Iridology Practitioners Association Iridology Symposiums. 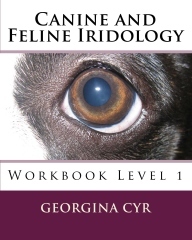 Canine and Feline Iridology – Introduction (Workbook Level 1) is a beautiful complete color workbook with all the information you need to learn basic Canine and Feline iridology. This book includes all terminology, iris signs, photos for identification and examples, as well as case studies of dogs and cats based on iris signs. Also included are examples of terminology, analysis techniques, as well as histories and case studies of dog and cat eyes. When you feel ready, email our office at to request your evaluation exam and it will be sent to you. The evaluation exam is a multiple choice, true/false exam which you will complete and email back to us for an evaluation of your knowledge. Upon satisfactory completion of the evaluation exam, you will receive a certificate for having completed the Canine Feline Iridology Course. Skayter has a very healthy looking eye. Acute conditions show up as white markings in the fibers of the iris and are generally associated with pain and inflammation. An iris analysis can help to explain what the source or where the original cause of a health problem might be coming from, which can be quite different than the symptoms displayed. For instance a client reports, “My dog or cat’s fur is falling out over its back and the skin is bumpy, dry, flaky and smelly. I think they have a food allergy”. Upon performing an iris analysis, the iridologist will see signs that would indicate skin irritation and the veterinarian may diagnose the bumps as mites or mange, but the core root of the issue or cause may be seen in the eye as a low immune system or condition in the intestine or stomach contributing to the mites taking over the body, allowing the mites to flourish. Many types of mites are normally present in small numbers in the skin of healthy dogs, but when a dog’s immune system becomes weakened, the mites can overgrow and cause disease and inflammation of the skin. What can be seen with iridology is the condition of the body’s immune system and tissue condition top reveal the source of the skin problems. Iridology in itself is not an actual treatment. It is a non-invasive method, often used by homeopaths, naturopaths, holistic veterinarians, and other natural animal health practitioners to determine a required treatment plan. Unusual Sudden Reactivity to their Environment or Other Animals. Neela had been badly beaten before she came into Boxer Rescue. She is showing dark almost black pigment in the lighter brown areas which were the areas of the body most affected by the beatings. Over the years the dark pigments have become darker and represent the more chronic issues of pain and stiffness. Neela has very weak digestion which is represented by the very dark area just surrounding the pupil. We have supplemented her food with herbal and nutritional supplement so help her digest easier. Although Neela had cancer for several years, with the help of herbs like Paw Paw and other Natures Sunshine supplements, she was able to run and play like a puppy until she was12 years old. This photo is showing the darker golden ring just outside of Tork’s pupil. This is representing less resiliency in the stomach. Tork never had symptoms of stomach issues, but she always slept a lot, and once we saw in her eye that she wasn’t able to obtain the nutrients in her food, we added nutritional supplements and changed the food. As a result, her energy picked up. Today she is very active at 12 years old. You can also see the bumpiness in the yellow green area outside of the golden brown in her eye. That bumpiness represents low energy to the lungs. Tork had also been prone to allergies but since the change in food she has been very healthy.